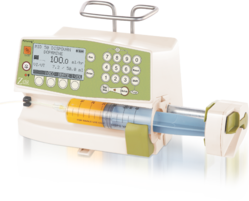 The Plenum's Syringe Pumps are designed to infuse the drug into the vascular system of humans. Each machine is accomplished with microprocessor control of flow rate & volume, activates alarm automatically if the infusion rate cannot be maintained or the solution runs out- all provided by a motor - driven mechanism. We are one of the leading syringe pump manufacturer in India. Battery Status: Display in Bars OR hrs, and min. Data Log Event: 500 data log events in real time Expandable upto 1500 nos. 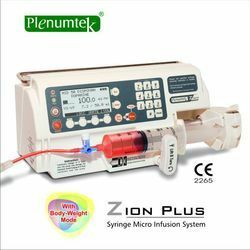 he Plenum's Syringe Infusion Pumps Model ZION are designed to infuse the drug into the vascular system of humans. Each machine is accomplished with microprocessor control of flow rate & volume, activates alarm automatically if the infusion rate cannot be maintained or the solution runs out- all provided by a motor - driven mechanism. We are one of the leading syringe pump manufacturer in India. Packaging Details: Well Packed in Board Boxes. Dimensions 135 (H) x 272 (W) x 150 (D) mm / Weight: 2.3 Kgs./ Housing: ABS Plastic. Power Source 110/220 VAC (+/-10%), 50/60Hz, 12 VA, external power 12 VDC by a converter. 3] Volume / time: 0.1-999.9 ml; 00h01- 100h00. # Dilution setting: X mg/ml or X mg / Y ml. DRUG LABELLING: Display of the available drug name from the drug library. User can add or delete drug names up to 64 nos. DRUG LIBRARY (Optional): In built ‘PRUDENT’ Drug library editor for setting normal infusion, bolus and loading dose parameters. Adjustment of the dilution, default infusion modes, flow rate and bolus limits in ml/h. END OF INFUSION: (V/T & VL) KVO: from 0.1 to 5 ml/h adjustable and storable, continuous infusion or stop. PAUSE: Programmable from 1 minute to 24 hours, increments from minute to minute. DATA LOG EVENT: 500 data log events in real time expandable up to 1500 nos. DPS: The Dynamic Pressure System - DPS - warns of pressure variations. A risk of obstruction or a possible leak in the infusion line can thus be anticipated. ANTI-BOLUS SYSTEM: Reduces significantly bolus after occlusion release. PUMP STATUS: Red for AC power status and Yellow for infusion in progress. Idle/ Non operative time over. Visibility up to 5 meters. All alarms are expressed by means of flashing messages on LCD, graphics and sound beep. SYRINGE POSITION CONTROL: Syringe barrel knob check, Plunger head detection, Anti-siphon system check, Flange detection. INFUSION CONTROL: Occlusion pressure pre-alarm, Occlusion pressure alarm, End of infusion pre-alarm, End of infusion alarm, Syringe empty, KVO, Volume limit pre-alarm, Volume limit alarm, Keypad locking, Hard and soft flow rate limits. BATTERY: 8.4V Rechargeable Ni-Mh, Capacity minimum:10 hrs @ 5 ml/hr, Battery replacement: separate compartment – no need for electrical security testing. STACKABILITY (Optional): Up to 3 devices self – stackable on a pole. 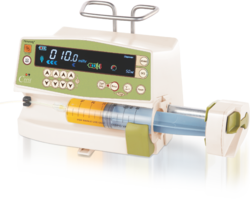 Looking for Syringe Infusion Pump ?